Rek-O-Kut Dust Bug Anti-Static Dust Remover (Free Shipping!) - Tracer Technologies Inc.
Our latest product is an auxiliary arm with a carbon fiber brush. 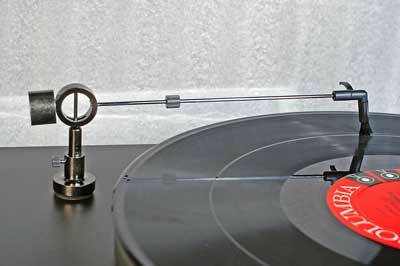 This device constantly cleans records while they play. Not only that, but the carbon fiber brush discharges the record surface of all static electricity, thus removing all static discharges and pops that can annoy and frustrate the listener. The DUST BUG is solidly built of all metal parts. It can be adhered with its self-adhesive base safely to any playing deck and accommodate platters up to 2 - 1/8 inches (55 mm) in height. Arm height is easily adjusted by a thumbscrew, and its downward pressure by a sliding weight. Included is ground wire and a cleaning brush.